What's on your Canadian travel bucket list? 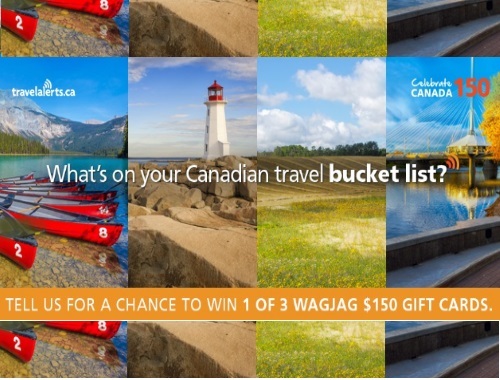 Tell us for a chance to win 1 of 3 Wagjag $150 gift cards! WagJag's travel category has the perfect short trip for you and your sweetheart, or for the entire family. Whether you're interested in checking out some of the attractions in Niagara Falls or would prefer a quiet getaway in Muskoka, WagJag has multiple options that are sure to pique your interest! Contest closes June 12, 2017.